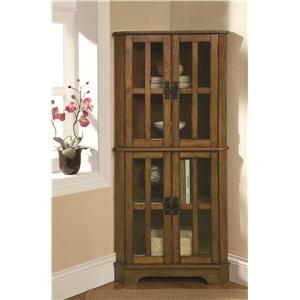 This three tier curio cabinet is traditionally fashioned to add great storage to your home. 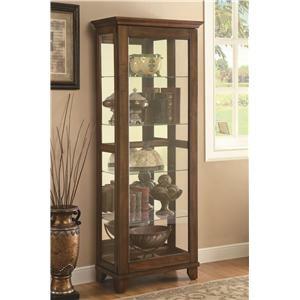 With six shelves, ample space is provided for displaying all of your favorite collectibles and décor with ease. Simple mouldings grace the cabinet woodwork while also adding a hint of visual depth that will not go unnoticed. A middle wood contour creates the appearance of two compartments, giving you the opportunity to organize your accents if desired. A rich brown finish reinforces its traditional design, and its unique shape gives it a structural detail to add style and textual interest to your home. 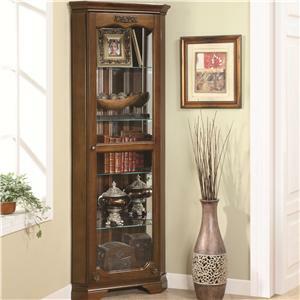 The Curio Cabinets Solid Wood Cherry Glass Corner Curio Cabinet with 6 Shelves by Coaster at Value City Furniture in the New Jersey, NJ, Staten Island, Hoboken area. Product availability may vary. Contact us for the most current availability on this product.